Don't worry if your passport's not current; we've got you covered! We celebrate the GURPS Hot Spots series – and especially the newly released GURPS Hot Spots: Renaissance Venice – with Pyramid #3/117: Hot Spots. This issue includes a mini-supplement about Paris at the turn of the 20th century, a guide to East Berlin at the height of the Cold War, and a visit to Victoria in the future of Transhuman Space. It also offers more adventure seeds to use with Renaissance Venice, plus a fully mapped Renaissance villa from Renaissance Venice author Matt Riggsby. 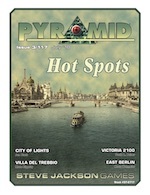 Traveling the globe from the comfort of your favorite PDF reader has never been easier, thanks to Pyramid #3/117: Hot Spots. Download it today from Warehouse 23!